January is often preschool registration so I invited a Montessori educator, Deb Chitwood, to share about the Montessori philosophy of learning. I’m a Montessori educator/writer, so I’m biased. Still, I think Montessori education should have a place in every family. In fact, you’re probably using a number of Montessori principles already – even if you’ve never considered Montessori. Montessori education is a system of education developed by Dr. Maria Montessori in Italy in the early 1900s. It’s most commonly seen in preschools, but there are Montessori schools from preschool through high school throughout the world. Montessori education is also becoming more and more popular as a method of homeschooling. The primary focus is to follow the child, observing the child’s needs and interests and individualizing education based on those observations. I wrote a post that has much more information and a helpful video: M is for Montessori. There are 3 options for incorporating Montessori education into your family. The level of Montessori involvement is up to you, and the only right answer is the one that’s right for your unique family. 1. Use Montessori principles at home. This can work for any family. Whether you use a few or many Montessori principles, you can help your child academically as well as help your child develop order, concentration, coordination, and independence. Top 10 Montessori Principles for Natural Learning gives ideas that can work in any home, regardless of where your child attends school. 2. Enroll your child in a Montessori school. There are Montessori programs for infants and toddlers, although the recommended age for a child to start Montessori is 3 years old. Some Montessori preschool classrooms do accept 2½ year olds. Montessori schools have mixed ages together in the same classroom and a 3-year cycle, so you’ll want to enroll your child by age 3 if possible. Some schools have long waiting lists, so you can’t start looking too early. When I had a Montessori school, a few parents signed up on the preschool waiting list when their baby was born. Of course, the economic climate affects school enrollments, so there are generally more spaces available in private Montessori schools today. Here’s a post about choosing a Montessori preschool that has related videos: How to Choose a Montessori Preschool for Your Child. Here’s a post with information and links to famous Montessorians: Famous People Who Were Influenced by Montessori. 3. Set up a Montessori homeschool classroom. This option obviously requires the most work and time commitment on your part, but it’s more economical than enrolling your child in a Montessori school unless you can find a public Montessori school in your area. 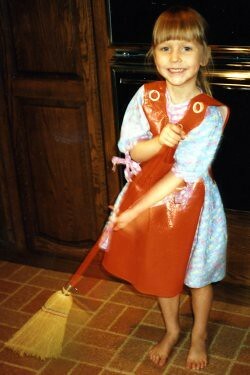 I’ve been a Montessori teacher, Montessori parent, and Montessori homeschooler. Each role was wonderful, and it just depended on my family circumstances as to which was right at the time. This post and its links will help if you want to set up a Montessori homeschool classroom: How to Set Up a Montessori Preschool Classroom at Home. Deb Chitwood is a certified Montessori teacher with a master’s degree in Early Childhood Studies. She taught in Montessori schools in Iowa and Arizona before becoming owner/director/teacher of her own Montessori school in South Dakota. Later, she homeschooled her two children through high school. Deb is now a Montessori writer who lives in Colorado Springs with her husband of 36 years and their cat of 10 years. activities for the kids are really enjoying I haven’t read blog like this i was lucky to visit your site. This is exactly what we’re doing at home and love it. My daughter received an Abacus for christmas and we’ve been having so much fun learning with it. I love the child-focused, individual learning that it allows. It’s so important! I am often over at Living Montessori Now—it is filled with ideas of how to incorporate Montessori methods into teaching at home. This post here was a clear, concise piece of how to integrate Montessori into your own family’s life. I like how it was presented in varying degrees/ways of integration—from using some of the principles at home, to considering a Montessori school, to setting up a home classroom. Many great links here! Great post Deb! I need to incorporate more Montessori principles into our home. My son’s preschool uses several elements (it is kind of a hodpodge of a variety of things) and he loves them. what was difficult for me to commit to montessori was to get my child there 5 days a week by 8:30. she was a night hour and i felt like 5 days a week was too much for a 2 year old. I agree – not sure about why that is, maybe Deb can explain the reasoning behind it. Also, it is expensive. That’s a good point, PragmaticMom! Many Montessori preschools require 5 days a week because a consistent routine is best for young children. Most children feel very secure and thrive in a 5-day program, with a sense of community developing within the Montessori classroom. Some schools do have 2- and 3-day programs as well, though, especially for children under age 3. A number of Montessori schools offer separate morning and afternoon classes. My kids (as well as my husband and I) were always night owls. 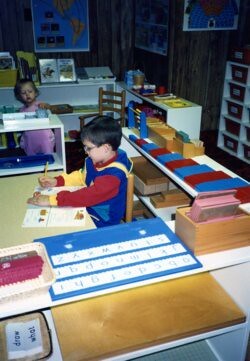 When my son was 2 1/2, he was a student in my Montessori school. I had him in the 5-day afternoon class so that he could follow his normal sleep schedule. It worked perfectly for him. Of course, most children will adjust to a consistent morning schedule, and my kids had to do that for figure skating training when they were older even though we homeschooled then. But it is definitely nice if you can find a school you love that has a schedule that works well for your child. Great post, Deb! My son had a wonderful experience in a Montessori preschool and kindergarten. His teacher had 30 years experience as a Montessori director and it was incredible to see her classroom and how independent and peaceful the kids were. I really think it has given him a set of skills that will stay with him. If you want to foster a life long love of learning and you support and celebrate creativity, independence and choice; then Montessori should absolutely have a place in your family. Sorry for the typos. Ugh. iPad. Ths is great! Passing it on to a friend. You had asked before what aspects of Montessori I had heard criticisms about…I couldn’t comment since I’m having technical issues leaving comments and hope this one goes through. I had friends who did not like formalmontessori schools thawed only advanced the top 25 per cent of a class to the next level. Our school does not practice that rule for advancement. Some felt that the emphasis on one activity at a time discouraged creativity. I, personally, practice some parenting philosophies that are not perfectly in line with the major theme of early self-sufficiency ( Particularly when it comes to potty training and co sleeping). But I love the Montessori gands- on method of learning. Our daughter attends a bilingual Montessori pre-school. The feedback is always 360… And parents are highly involved. Great post! Thanks, Tricia! Your daughter’s bilingual Montessori preschool sounds wonderful! The name Montessori isn’t trademarked, so there can be a lot of variation between Montessori schools. I’m not sure how many Montessori schools only advance the top 25 percent to the next level. Montessori education should be individualized. If children move on to an elementary classroom, it would generally be after their 3 years in the preschool classroom. The order and steps in an activity are ideally launching points. Typically, an orderly foundation gives the child confidence to come up with creative extensions to an activity (where the child might use a number of materials together). Here’s a post with links to some awesome sensorial extensions: http://livingmontessorinow.com/2011/09/05/montessori-monday-sensorial-size-extensions/.